You are currently browsing articles tagged Lake Paradise. 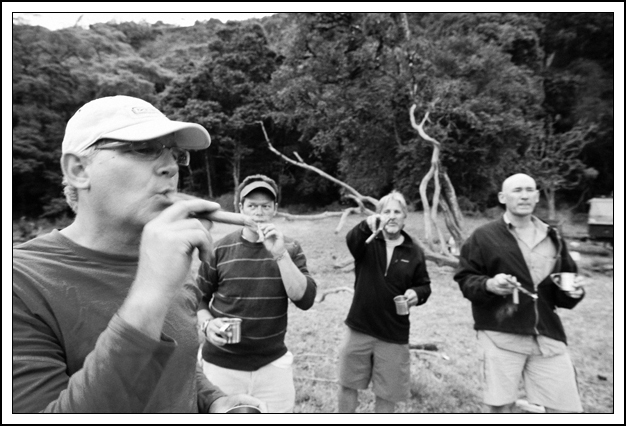 The boys smoke a farewell cigar at Lake Paradise. Photo and video by David Lansing. It’s interesting that Lake Paradise is so close to the 3-million-year-old Koobi Fora paleontological site first discovered by Richard Leakey and his team in 1972 and now thought of as the “Cradle of Mankind” and the most likely site of the biblical Garden of Eden. Koobi Fora may be the cradle of mankind but to me Lake Paradise feels like the Garden of Eden. Which, frankly, came as a bit of a surprise to all of us. 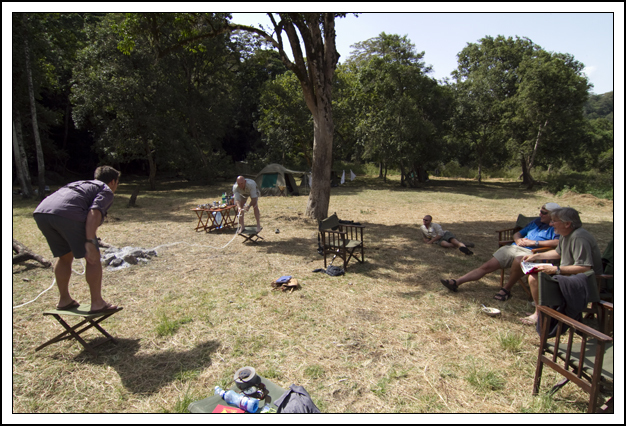 The purpose of this expedition was to see if any sort of Paradise, literally and figuratively, still existed in Kenya. And the short answer is, yes, it does. On this trip we’ve visited several different types of African paradise, the first being the pristine environment near Cottar’s 1920s Safari Camp in a corner of the Mara-Serengeti and even that was unexpected. When we’d first discussed going on this expedition there was a certain resistance, particularly by the photographer Pete McBride, to visiting the Mara. Pete was worried there wouldn’t be much to see (or, for him, to photograph) in the Mara and that Calvin’s camp would treat us, as he wrote me, like “elderly British folk who are more interested in tea time and china than seeing an elephant up close during musk.” He also warned me that there would be a million mini-vans running around chasing animals up one ridge and down another. But that wasn’t the case. What we got instead was a close-up view of thousands of animals, from elephants to wildebeests to cheetahs, and never once came across another game-viewing vehicle. Paradise indeed. 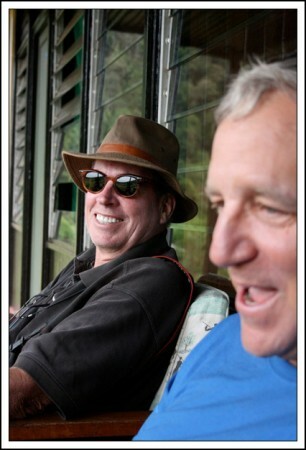 Even Pete the Cynic was shocked by how pristine Calvin’s little corner of the Mara was and how much game life we saw. The focus here for us wasn’t so much on the animals (although we did see elephants and giraffes and various members of the antelope family such as gerenuks) but on the setting and the Samburu people. To visit the Singing Wells and to watch the young Samburu warriors dance in a sand river at sunset was to confuse time and suddenly find yourself swept back into a world that existed hundreds of years ago. Some 80 years later, I can echo Martin’s words. Is it like it was when Osa and Martin first came here in 1921? No. There are not nearly as many elephants and the ones that are here are not the famous ancient beasts with tusks so large that, for at least two of them, they had armed game wardens protecting them from poachers. The rhinos that used to drive Osa Johnson crazy because they seemed to be everywhere have disappeared completely and the large herds of buffalo have diminished greatly as well. And the lake, with its “unsurpassable beauty” has mostly disappeared and probably will never return. Still. The ancient forest of old cedars and figs and African brown olive trees are still here. The great number of birds and waterfowl that made such an impression on Osa are still here, perhaps in even greater number. As are the clouds of butterflies she wrote about. Calvin estimates that there are hundreds of different species of butterflies here, many of them unidentified, and that there are probably some unique species of plants and trees that have evolved over millions of years that are no place else in the world. “It’s an island of species development,” he says. It is, in fact, Paradise. One I hope I get back to one day. 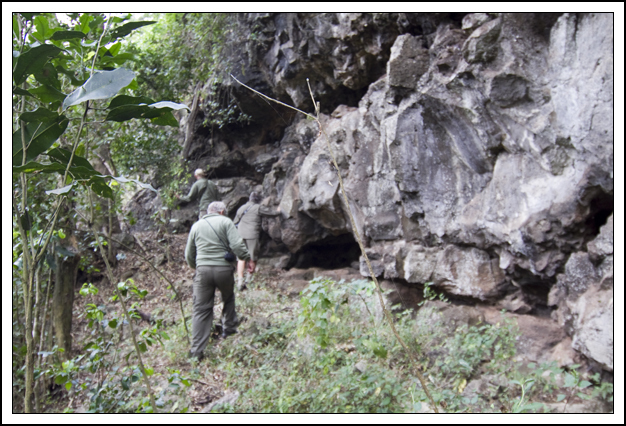 Here’s a short video of Calvin Cottar discussing our discoveries of paradise in Kenya. Our final look at Lake Paradise. Photos by Chris Fletcher. When I got up, Eddie and Kurani were already breaking camp. It was very sad to sit around the smoldering campfire knowing this was our last morning at Lake Paradise. While Julius was making a final breakfast, cooking up the last of the sausages and bacon, we all packed. Even while I was stuffing clothes in my duffel bag on my cot, Kurani was pulling up the tent stakes. By the time I was done, the tent, which had felt like home, was sagging around my head. The plan was for Calvin to drive us into Marsabit where a small plane from Tropic Air would, we hope, be waiting for us, and then the four of us—Hardy, Fletch, Pedro and myself—would fly to Samburu where Pete and I would get off and spend some time at the Elephant Watch Camp and Hardy and Fletch would continue on to Nairobi. Calvin and his crew would then drive the two vehicles down to Elephant Watch Camp and join us for an evening before continuing on. We headed out of camp with the dew still bright on the grasses and the sun having just risen over the rim of the crater. The woods were alive with baboons and birds and all the little dudus that hum and whir in the first heat of day. Clouds of waterfowl were coming in from their evening roosts in the trees and guinea fowl ran across the road in front of us, cackling in their indignity of our disturbing their pecking of insects in the short grass over the road. Me in front of our plane at the Marsabit airport. It was just a gorgeous morning; so gorgeous my heart felt heavy and I could hardly breath. 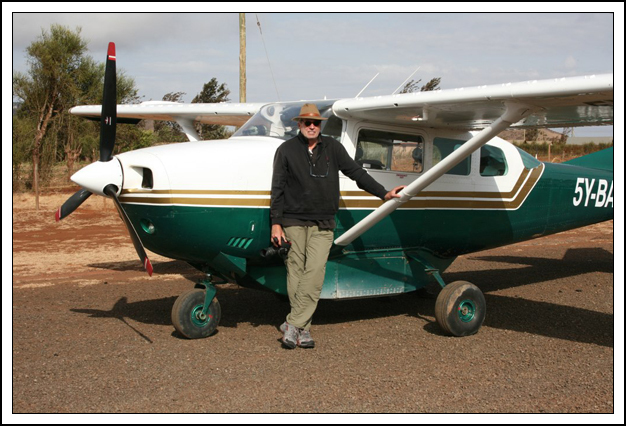 Once we were off the mountain, Calvin was in a hurry to get us to the Marsabit airstrip. He’d coordinated the time of our arrival with Tropic Air and his thought was that he wanted to be pulling up with us two or three minutes after the plane had landed. He didn’t like the idea of us or the pilot having to wait around. As I’ve said before, this is a very troubled area what with the shiftas and all and there’s no need to invite trouble. When we got to the airstrip the little 6-passenger Cessna was waiting for us. The wind was blowing sharply and it was cold enough that all of us were wearing jackets. We quickly loaded our gear and took off, waving at Calvin. I was in the co-pilot seat and Pedro was in the back where he could lower one of the rear windows and stick his head out to do some aerial photography. He asked the pilot to fly north over Lake Paradise. 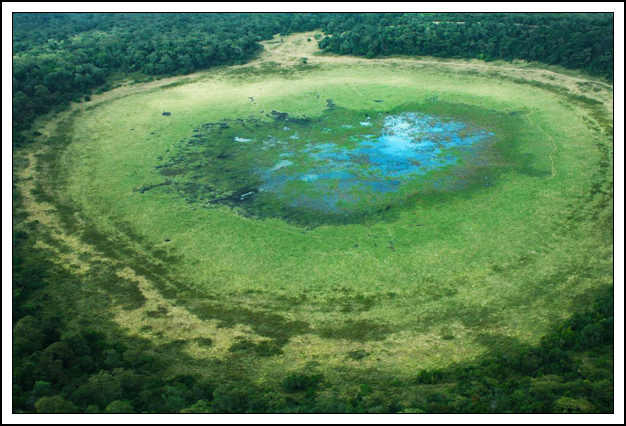 The wind was blowing so hard that the pilot was nervous about slowing the plane too much, afraid it might stall, but he dipped his wing and we came in low over the extinct crater, low enough so that we could see the elephants drinking from the shallow pools one last time. We circled all the way round the caldera, slowly, slowly, with Pete hanging out the window and the rest of us with our faces pressed against the glass trying to get one last view. And then the pilot straightened out the plane and turned it south, towards Samburu and Lake Paradise was behind us. In December of 1926, Osa and Martin Johnson closed down their camp at Lake Paradise and began the long journey home over the Kaisut Desert. They went first to Nairobi and Mombasa before sailing to London and New York where they began working on their film together and arranging a world lecture tour. But they never forgot about Lake Paradise. The Maasai have a saying: Epwo m-baa poking in-gitin’got, which means basically “Everything has an end.” Martin Johnson never made it back to Lake Paradise. He died in a plane crash on January 12, 1937. Pedro, left, takes on Calvin in tug-of-war game. Photo and video by David Lansing. When Pedro gets done with his photo shoot, he challenges Calvin, eight years his senior, to a sort of tug-of-war camp game. He gets a length of rope about 25- or 30-feet long and the two stand facing each other on camp stools, each having about ten feet of rope behind them. The goal is to either pull your opponent off the stool or have them run out of rope. It’s more mental than physical. The game is as much about feints and quick reactions as anything. You’re trying to figure out if your opponent is going to try and jerk you off your stool or just take little tugs at the rope trying to get you off balance. Calvin seems immediately at a disadvantage but then he starts to figure out what Pete is doing and almost topples him before losing. Then Hardy takes on Pedro. Now, the thing is that winning this game once doesn’t give you much of an advantage against your next opponent. You’re winded, your opponent has been watching your moves, plus, you’ve got a bit of rope burn already. So not too surprisingly, Hardy knocks off Pedro. And then takes on Fletcher, who now has the advantage of having watched the tactics of three different contestants in two matches. Fletcher easily conquers Hardy. And now takes on Calvin. Who, not too surprisingly, defeats Fletcher, knocking him back against a log so he scrapes up his leg. So now all the boys have rope burns and a couple of them have twisted an ankle or scraped a leg, and all of them are sweating and winded. Meanwhile, I read my book and finish my cold beer. Here’s a short video of Pedro taking on Calvin. 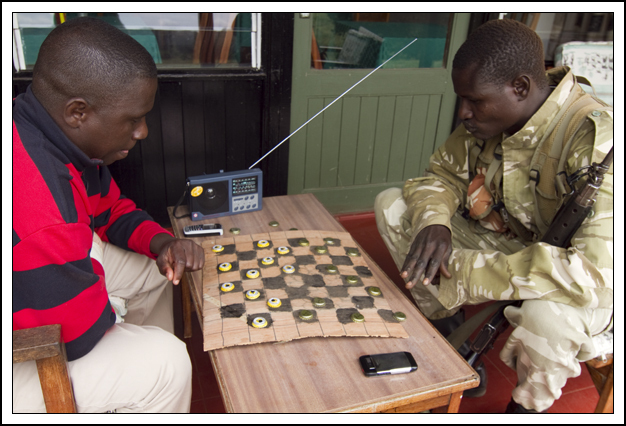 A lodge employee and our armed askari playing checkers with beer caps. Photo by David Lansing. Lake Paradise is actually an extinct volcanic crater known as a gof (the named given to them by the local Borana people) and it’s not the only gof on Mount Marsabit. In looking at my map of the area I count at least a dozen others. One, called Gof Sokorta Diko, is about a 45-minute drive away on the windy road that goes through the forest. The thing that’s interesting about this gof is that there’s a lodge there. Or so we think. When I was first researching this story and trying to figure out where we were going to stay, I came across this lodge which was variously described as either “refurbished” or “grungy.” Some sites even suggested that the lodge was now closed. So on Saturday we decided to go on an outing to the lodge to see what was there. The short answer is, not much. In fact, when we first pulled up to the lodge, which is just a simple rectangular structure with a corrugated tin roof, we thought it was closed. But the front door wasn’t locked so we walked in and started yelling “Hello!” which must have scared to death the two caretakers who were sitting on the veranda outside playing a game of checkers on a home-made board using beer bottle caps for pieces. There was a little bar in the lobby of the lodge and a seating area around a low table covered with a yellow check tablecloth atop which were four or five magazines that were at least three or four years old. Most of the other furniture in the lobby was covered with green sheets. We asked the caretaker if he had beer and he said he had Tusker lager or Tusker premium lager (which accounted for the two different types of beer caps being used in the checkers game). We ordered a couple bottles of each and went and sat on the veranda that overlooks a meadow that, like Paradise, used to be a lake. We knew that because there were old B&W photos in the bar of the lake with water going almost all the way up to the lodge. Still, it was a pleasant setting. When the caretaker brought our beers, they were warm. We asked him if he had any cold ones and he said he didn’t. “No electricity.” He told us that the lodge had a generator and when they had guests, they turned the generator on, but right now they had no guests. “Have you had guests recently?” I asked him. “No, sir.” He said he couldn’t remember exactly when they last had guests but he was pretty sure it was sometime this year. Or maybe last year. Hardy trying his best to annoy me. Photo by Chris Fletcher. There was a small TV on a table in the bar and Hardy asked him if it worked. The caretaker said they could get one or two channels—when the generator was on. Since it was Saturday, Hardy joked that perhaps we should pay to have the generator fired up and see if we could catch a football game. He was only joking, I think, but it irritated me and I told him that we had not come all the way to Lake Paradise so that we could watch a Saturday afternoon football game at the Marsabit Lodge. This was a mistake on my part. Whenever I get indignant, Hardy gets amused. So he started to make a big deal out of it. He talked to Fletcher and Pedro and asked them if they were willing to chip in on the cost of the fuel for the generator so they could get the TV fired up. I said we needed to get going. Hardy said that was fine. They’d stay and watch a game and walk back to camp. Of course there was no way they were going to walk back to camp. It had taken us almost an hour to drive here through the forest and it was already late in the afternoon and there was no way Calvin would ever let them walk back to Lake Paradise at twilight which is when all the big game starts moving towards the water. I knew that and Hardy knew I knew it, but I was annoyed none-the-less, which gave him great satisfaction. Eventually we paid our bar bill and got back into the Land Cruiser and headed back through the forest to Lake Paradise, but even then Hardy wouldn’t let it go. He was having too much fun. Maybe when we get back to camp, Hardy said, we could drop Lansing off and then go back to the lodge and watch a game. What do you think Calvin? At this point, even Calvin could see how annoyed I was so he played along and said, Sure, great idea. And that was the end of it. Except for the barely suppressed chortling in the back seat from Hardy and Fletcher and Pedro. Calvin leads the boys in search of a leopard at Lake Paradise. Photo and video by David Lansing. To see a cheetah or a lion from the open roof of a Land Cruiser or some other safari vehicle is a wonderful thing but after the first encounter you lose any sense of fear you might have correctly brought with you into the bush and, after awhile, you even start to feel a bit blasé about the whole thing. Oh, look, another herd of elephants…shall we head back to camp for cocktails? It can’t be helped. Viewing wildlife from a minivan is really very much like going to the zoo. You know the elephant isn’t going to charge your Toyota. You know the lion is unconcerned with your minivan. But get out on foot in the bundu or the forest and it’s a very different thing. The elephant and the lion and the other masters of the wilderness are habituated to vehicles; they know what they smell like and look like and they aren’t afraid of them. A man on foot is a different thing. A man stalking them on foot is a predator to be feared; or perhaps a meal. Yes, this is exactly how you imagine the conversation to go between a baboon and a leopard, they are such mortal enemies. Since we had been in camp now for quite some time, Calvin figured the leopard that lived in the caves above our camp might be getting used to us and becoming less cautious. Perhaps we could lure him into the open. So this morning after breakfast we bundled up in forest-green fleece and set off into the woods in search of the leopard that has been keeping us up most nights. The plan was to find a spot in the forest above the camp and hunker down while Calvin made odd noises to imitate an injured bushbuck, a small, rather elegant member of the antelope family that is a favorite meal of the leopard (in our walk, we came across the lower jaw bone of a bushbuck, giving further credence to Calvin’s idea that our leopard friend might be enticed to come out of his lair if he thought there was a wounded animal so near to him). Hunker down on the ground, Calvin whispered. Do not move; do not make any noise. Then Calvin found a perch on the rocks above us and, with the Rigby .500 in his lap, began to make his dying-bushbuck call which, to me, sounded more like a dying duck. In any case, the leopard wasn’t enticed to come and take a look. But we did get a response from an old lion somewhere further off in the woods. Which was a bit disconcerting. Anyway, here’s a short video of Calvin making his bushbuck noises in the woods of Lake Paradise.